Complete Tattoo Removal is a process through which the tattoo is completely removed and the affected skin area is freed from the tattoo. Laser tattoo removal is a gradual process and treatments are repeated until the tattoo is removed. There are a number of factors that affect the duration of tattoo removal sessions as well as the number of sessions needed to remove the tattoo entirely. These factors include the size of the tattoo, the area of the tattoo, the condition of the skin as well as the colors, potency, and depth of the tattoo. Laser tattoo removal sessions may take between five to twenty minutes and, depending on the factors mentioned above, the frequency of sessions may be between four to eight weeks. Laser Tattoo Fading is a laser tattoo removal process that aims at fading or weakening the appearance of an existing tattoo. The treatment applied is the same treatment as used in complete tattoo removal with lesser number of treatment sessions. The factors involved in the duration of the overall tattoo fading process and sessions duration include the size of the tattoo, the area of the tattoo, the condition of the skin as well as the colors, potency, and depth of the tattoo. Different types and colors of ink may require varying treatment duration. Tattoo fading is becoming increasingly popular as people become more interested in tattoo cover-up where the existing tattoo be covered with a newer one. 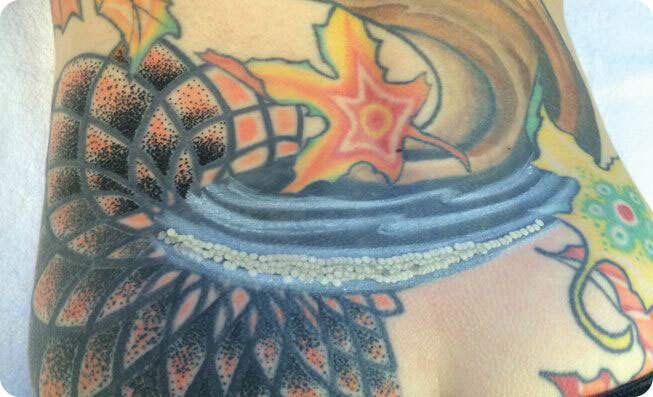 Precision Laser Tattoo Fading is a process where only a targeted portion of the tattoo is faded. This is often the case where patients seek to have only a portion of their tattoos covered up or added to. Our equipment and skills enable us to perform partial tattoo fading with precision. This prepares a tattoo canvas area to be re-tattooed and the over-all tattoo work improved. This process can be complex as we take extreme care in preserving the quality and appearance of the other tattoo parts the client wants to keep, therefore, it is advanced laser tattoo fading technology applied with high skill and artistic approach. 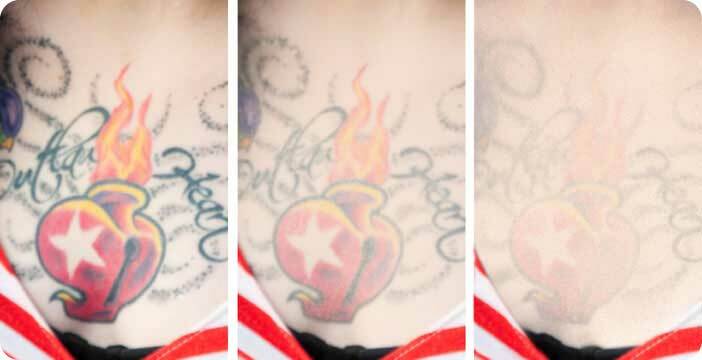 Laser Tattoo Fading uses the same equipment and techniques applied for complete tattoo removal, therefore, fading can be applied until the tattoo is completely removed. There is no time limits and thresholds involved in continuing with tattoo fading which mean that a client may schedule their tattoo fading over a long or short period where, regardless of time passed, the fading process simply continues. 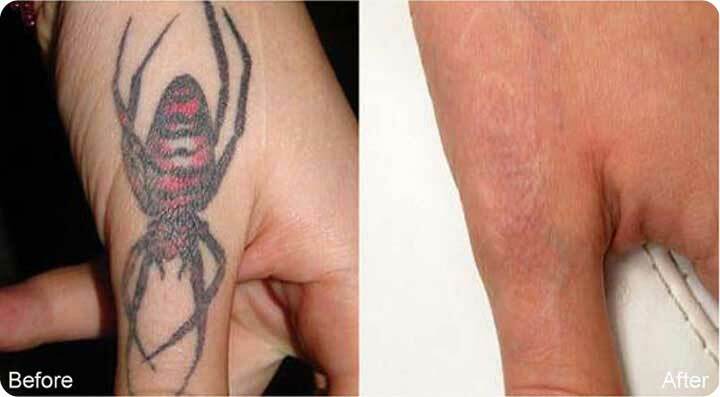 Laser Tattoo Fading is the recommended process before Tattoo Cover-up. Tattoo Fading will prepare the existing tattooed area for the addition of the cover-up tattoo by weakening the original tattoo which ultimately means more effective cover tattoo. Patients may also opt for tattoo fading to prepare a tattoo to be changed or added to where they chose to change only parts of their tattoo. In all cases, Premium Tattoo Removal’s staff are happy to discuss the level of tattoo fading required for your cover-up tattoo. Work with your tattoo artist to ensure that your tattoo fading serves the process of making re-tattooing easier and more effective. Cosmetic Laser Tattoo Removal requires knowledge and skill as it is often performed on delicate areas of the body including eyebrows and lips. Safety and gentle treatment are key to successful cosmetic laser tattoo removal. It is a fact that people who are dissatisfied with cosmetic tattoos are affected emotionally and psychologically by their dislike of the tattoos and are often eager to have their cosmetic tattoos removed as quickly as possible. We feel rewarded with the satisfaction we feel from patients when we help them get rid of their unwanted permanent tattoo eyebrows. Cosmetics are an evolving part of the fashion industry and we understand the frustration of a patient who may feel that they carry an outdated fashion statement. Therefore, we give priority and attention to ensuring that the affected patient can restore the image they wish to present. This is achieved with precision and effectiveness using our advanced equipment and superior skills. Most permanent eyebrow tattoos take 1-12 laser sessions spaced 6-12 weeks apart for complete removal. The tattoo’s proximity to the eyes and surrounding face skin tissue requires attention to the safety of the procedure and ensuring that only the targeted are undergoes the tattoo removal process. We use advanced technology and techniques to achieve eyebrow removal without causing any damage or negative effect on the surrounding areas of the face. Important guidelines for permanent makeup removal can be found on our blog post page.